I am not much of a baker. Mostly because I am bad at measuring. It's not that I can't, it's that I usually don't. More accurately, I round measurements up, down, estimate, or throw out the book entirely and use whatever I have lying around that might work. That's pretty much how making these muffins went. It is hard to grate whole nutmeg and cinnamon stick into a teaspoon measure. Ever tried it? It doesn't work. The original recipe called for raisins, pecans, flavourless oil, and all purpose flour. 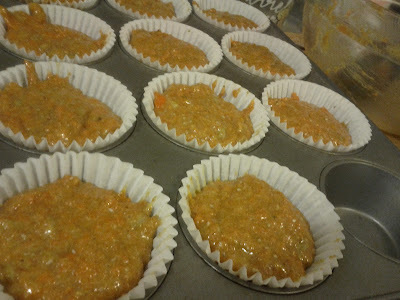 I used dried apricots, sunflower seeds, olive oil, and spelt flour. For good measure, I added orange zest and chia seeds to kick up the flavour and the health factor respectively. I also reduced the cooking time from 40 minutes to 25 because they were done. No one likes dry muffins and a great way to make them is to keep cooking them well after they are done. The picture to the left doesn't mention carrots except in the title. That is a mistake, there was 1 really big carrot grated really finely added to the wet ingredients, probably around a cups worth. 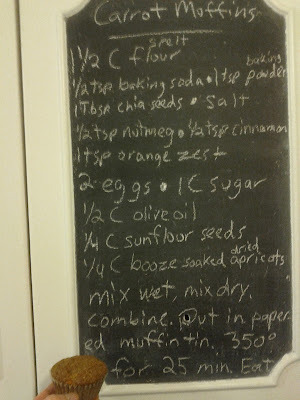 Once I mixed everything together, I put them in a papered (hard to read) muffin tin with an ice cream scoop. It made portioning the batter out super easy. A neat little trick I picked up from my mom. Spoons are for suckers, but scoops...Scoops!